As Jonathan Vos Post said: The books can be described as a mixture of Harry Potter and Indiana Jones but with cute kids. 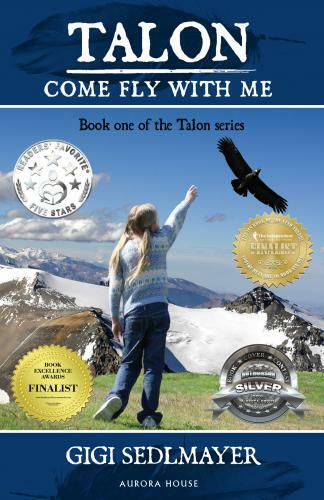 Best to describe by a reviewer: Talon Come Fly with me, the first book of a series, with 5 books now, (more to come) is an inspirational, engaging and thoughtful story. It follows the story of a little nine year old girl whose parents are missionaries in the small village of Pucara, Peru. Matica finds making friends with the local kids to be difficult. Matica has a condition that has hindered her growth, so she is extremely small like that of a two year old. The local Indians and villagers, don't understand her and are leery and mistrustful of her. Matica comes upon two condors, a male and a female. She is able to win their trust and begins to mysteriously communicate with them. Her adventure has begun. The condor's egg is stolen by poachers and Matica and her father set out to rescue it, and they are successful. With the condor's approval, Matica takes care of the precious egg. When the egg hatches,Matica becomes a substitute mother to the baby condor and names it,Talon. The local's observe the success Matica has had with the condors, and they begin to warm up to her. Eventually, tiny Matica becomes a well-liked, admired and respected part of the community. Talon, Come Fly with Me is filled with warmth and inspiration. It is a touching story about a nine year girl that overcomes her disability and uses it for something extraordinary. Her love for nature changes her life and it becomes meaningful and purposeful for her. Her disability is no longer a hindrance or something to be ashamed of. It is woven a tapestry of beauty, harmony and excitement in this fabulous story. It is filled with intrigue and even some suspense. I loved it and couldn't put it down and read it late into the night to find out what would happen next. It brought a feeling of serenity to my soul. I loved the tale of the giant magnificent condors, coupled with the human interaction. It is just a beautiful story that adults and children will both enjoy. It will be fully entertaining for the entire family. The book is full of emotion and love with important messages throughout. The exemplary descriptive writing had me on the beautiful scene watching on as the story unfolded. Gigi Sedlmayer is an excellent writer with a unique voice. This story is original, genuine and compelling. Artisan Book Reviews highly recommends it to all readers. It is a page-turner and a must read magical tale for everyone that likes clean, thoughtful and exciting reads about animals and extraordinary people.